The market for pharmaceutical bottles in Spain is characterized by its access to multiple regions through its strategic location in the Iberian Peninsula. Thanks to the geographic proximity and long coastline of this country, stretching through the Atlantic Ocean and the Mediterranean Sea, it has an easy access to emerging markets in the Middle East and Africa as well as the developed markets in Europe. The growth of the Spain market for pharmaceutical bottles has been directly influenced by the advancements in the drug delivery formats utilized for pharmaceutical products. In addition to this, the introduction of pharmaceutical bottles made up of plastic, on account of the abundant availability of relatively cheaper polymers, is expected to drive this market significantly over the forthcoming years. However, the emergence of eco-friendly biomaterials-based bottles as a substitute to the pharmaceutical ones and the increasing preference for flexible packaging formats, such as blisters, are anticipated to restrict the growth of this market to some extent in the years to come. In 2016, the market for pharmaceutical bottles in Spain presented an opportunity worth US$241.4 mn. Progressing at a steady CAGR of 3.80% between 2016 and 2024, the market is estimated to reach US$235 mn by the end of 2024. Pharmaceutical bottles find widespread application in E-liquid, liquids, droppers, oral care, and topical medication in Spain. The demand for these bottles has been higher in the oral care segment than others. In 2016, this application segment held a share of nearly 36% in the overall market and is anticipated to exhibit extensive incremental performance in terms of both, market share and growth rate over the next few years. Topical medication, on the other hand, is likely to surface as the most lucrative application segment in the Spain pharmaceutical bottles market in the near future, thanks to the design capabilities offered by manufacturers concerning the dispensing of lotions and semi-solid contents. The increasing demand for therapeutic medications related to eyes, ears, and nose, conventionally prescribed in dropper bottles, is likely to drive the dropper segment considerably in the years to come. The liquid segment is expected to gain from the augmenting demand for liquid medications as an efficient alternative to solid medicines from patients having swallowing issues. As E-liquid is in its budding stage, the segment is anticipated to exhibit moderate progress in the forthcoming years. High-density polyethylene (HDPE), polyethylene terephthalate (PET), low-density polyethylene (LDPE), polyvinyl chloride (PVC), and polypropylene (PP) are key types of materials used in the manufacturing of pharmaceutical bottles in Spain. Among these, the PET segment is witnessing a higher growth and is projected to remain so in the years to come, thanks to the increased usage of PET to produce pharmaceutical bottles due to its atmosphere barrier properties. The durability and the rigid and stress-resisting characteristics of PET are also aiding the rise of this segment significantly. Pharmaceutical enterprises, chemical firms, healthcare centers, compounding pharmacies, and pharmaceutical packaging companies have emerged as the main end users of pharmaceutical bottles in this country. Some of the leading manufacturers of pharmaceutical bottles in Spain are Pont Europe, Industrias Plasticas Puig SL, Maynard and Harris Plastics Ltd., Alcion Plasticos, Amcor Ltd., and Gerresheimer AG. This report provides forecast and analysis of the Spain pharmaceutical bottles market. The study provides historic data of 2016 along with forecast from 2017 to 2024 based on volume (Mn units) and revenue (US$ Mn). 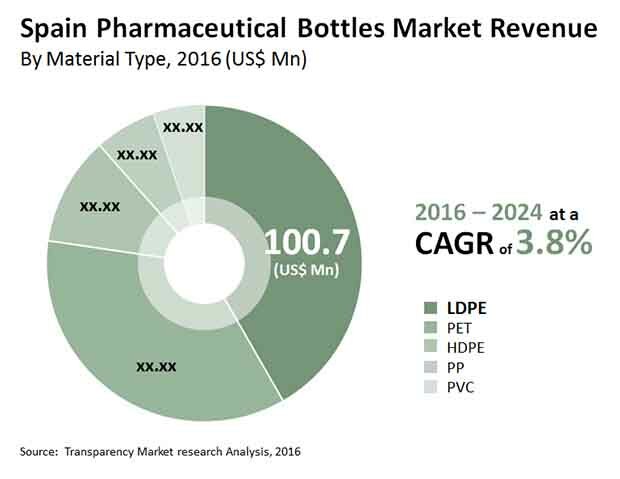 It includes drivers, restraints and the ongoing trend for the pharmaceutical bottles market along with their impact on demand during the forecast period. The report also comprises the study of opportunities available in the Spain market for pharmaceutical bottles. It includes value chain analysis with list of raw material manufacturers, plastic bottles manufacturers, packaging manufacturers, suppliers, distributors and end users in the value chain. In order to provide the users of this report with comprehensive view of market, we have included detailed competitiveness analysis and company players. The competitive dashboard provides detailed comparison of pharmaceutical bottles manufacturers on parameters such as company’s revenue, unique selling propositions and key strategic developments. The study encompasses market attractiveness analysis, by bottle type, application, material type and end user. Market statistics have been estimated based on average consumption and weighted average pricing of pharmaceutical bottles and the revenue is derived through regional pricing trends. Market size and forecast for each segment have been provided in the context of the Spain markets. The pharmaceutical plastics bottles market has been analyzed based on expected demand. Prices considered for the calculation of revenue are average regional prices obtained through primary quotes from numerous pharmaceutical bottles manufacturers, suppliers, and distributors. All key end users have been considered and potential applications have been estimated on the basis of secondary sources and feedback from primary respondents. Regional demand patterns have been considered while estimating the market for various end users of pharmaceutical bottles in Spain. Top-down approach has been used to estimate the Spain pharmaceutical bottles market. Market numbers for the Spain bottle type, application, material type and end user segments have been derived using the bottom-up approach, which is cumulative of region’s demand. The market has been forecasted based on constant currency rates. The report provides detailed competitive outlook including company profiles of key participants operating in the Spain market. Key players in the Spain bottle type, application, material type and end user market include, Gerresheimer AG., Amcor Limited, Alcion Plasticos, Maynard and Harris Plastics Ltd, Industrias Plasticas Puig, and Pont Europe.